Basia Goszczynska will make her Island debut at Sail MV’s upcoming Vineyard Cup. The New York–-based artist will make two sculptures out of locally gathered marine debris, one of which will be on display in the Awareness Tent at the Vineyard Haven Shipyard; the other one will be auctioned off at the benefit dinner. Their durability is one of the biggest reasons marine debris is an issue. Scientists don’t know exactly how long it takes for plastics and other debris to decompose; however, plastic bags are estimated at 20 years and water bottles come in at around 450 years. This buildup of plastics and other marine debris has serious side effects for wildlife, people, and the ocean environment. Goszczynska has always featured collected materials for her work, although her animation projects featured more organic materials. 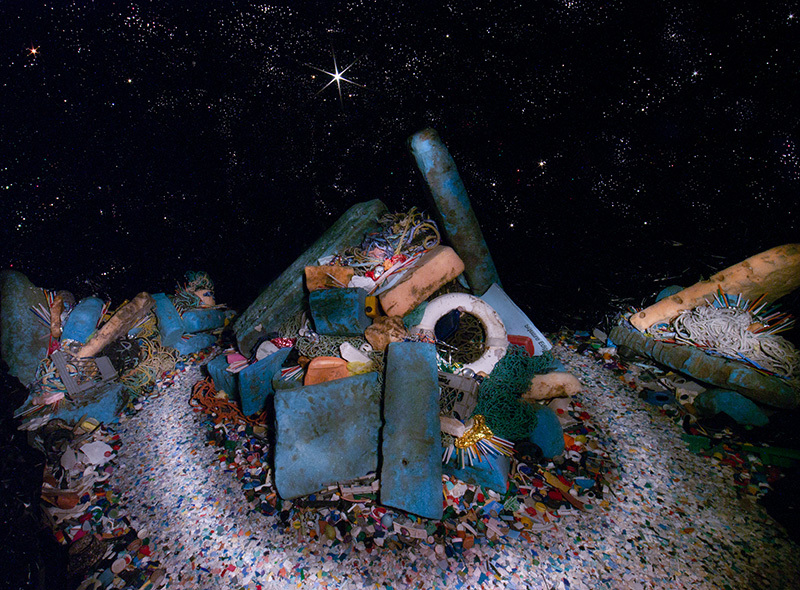 During beach walks to collect materials for her animation work, she began to notice all of the trash that was being washed up along the shore. “In the back of my mind, of course, there was this thought that it is a terrible thing that these materials were out there floating, but I couldn’t help but be drawn to them for their materiality and what I could potentially do with them that I wasn’t able to do with the organic things,” she said. It’s clear Goszczynska thinks through the collective experience of her work for the viewer. For a recent exhibit she connected to other artists and activists through hashtags on Instagram to get bags of microplastics. She used these tiny shards of plastic as a filler on the ground for people to walk on as they moved through her installation. “I think there’s a lot more thought given toward the idea of ‘Who is this art for? How is it functioning in the community?’ I definitely don’t want to make pretentious work. I don’t want to make work that doesn’t feel accessible or relevant to regular people,” she said. It was important in that project that the viewer have a tactile experience to her work and an olfactory experience; the materials used for the installation were cleaned, but they retained the smell of the ocean. Microplastics and other ocean debris aren’t the only form of waste Goszczynska is interested in working with. In the future, she is considering tackling textile waste, and grappling with the clothing industry’s model of fast fashion and its effect on the environment. For the present, however, you can check out her work at the Vineyard Cup, sponsored by Sail MV. The Vineyard Cup will be held from July 12 to 15. Opening night begins at 5 pm on Thursday, July 12, with a seafood dinner to benefit Sail MV. Tickets for the weekend and its events range from $25 through $255, and can be purchased on the Sail MV website, sailmv.org/vineyard-cup. Basia Goszczynska’s work can be viewed on her website, basiagoszczynska.com, or instagram @basia_gosz. The Vineyard Cup installation can be viewed at the Awareness Tent in the Vineyard Haven Shipyard over the weekend.